Another reason for not giving loan forgiveness!!! Many college students consider trading cryptocurrency to be a better use of their student loan money than traditional spending such school supplies and other living expenses. According to a study by The Student Loan Report, over one-fifth of current university students with student loan debt indicated that they used their borrowings to invest in digital currency such as bitcoin. The student loan news and information website found that 21.2% of the 1,000 students surveyed indicated that they used their borrowed cash to gamble on the highly volatile digital currency market. While school administrators may look down upon the practice of using borrowed funds for non-school expenses, the website indicates that there are currently no rules against it. College students are able to use loans for "living expenses," a flexible category that covers a wide range of potential necessities. As the average student now graduates with tens of thousands of dollars in student loan debt, investing in the crypto-market could either be an easy way to add to the burden, if the assets plummet in price, or in the best-case scenario, help them pay it off faster. According to higher-education expert Mark Kantrowitz, seven in 10 seniors are set to graduate this spring with borrowed money, carrying an average of $37,172 in student debt as they enter the workforce, as reported by the Wall Street Journal. Federal student loan interest rates range between 4% and 7% for the 2017 to 2018 school year, depending on the type of loan and level of education. Meanwhile, bitcoin has lost well over half of its value since reaching a record high just short of $20,000 in December 2017. At a price of $8,092.75 at 4:48 UTC on Tuesday, the price of bitcoin has tanked more than 14% over the last month, yet still reflects a near 700% gain over the last 12 months. Rival digital coins, such as ethereum, ripple, and litecoin, have also been on a rollercoaster ride this year, as investors become increasingly concerned about heightened regulation of the decentralized market. If they got in early, they did well. Like most people, they bought when it was most exciting - at the high. As long as they bought it below today's price, they're still good. After all, it was barely $1k at the start of last year. How upset would you be if "all" you did was merely double, triple or quadruple your money in the past year? Be somethin' to really cry over, huh? Stats can be very misleading. We need to hear something real like how much did they buy, not just the fact they they had brought some. The entire concept of taxpayer-backed student loans is the problem. Over $1,000,000,000,000 created out of thin air and "issued" to "students." Eisenhower warned everybody about the Military-Industrial Complex, but did anybody warn us about the Education-Industrial Complex? I don't know if the Founding Fathers are laughing or crying as they roll over in their graves. It’s 2018 and Americans are more burdened by student loan debt than ever. You’ve probably heard the statistics: Americans owe over $1.48 trillion in student loan debt, spread out among about 44 million borrowers. That’s about $620 billion more than the total U.S. credit card debt. In fact, the average Class of 2016 graduate has $37,172 in student loan debt, up six percent from last year. Banksters want the populace indoctrinated. They're eager to issue trillions out of thin air so these students can go to the indoctrination camps. Seems like a no-brainer. It's a win for the banksters whether the loans default or not. The banksters are out of the picture, at least directly. Barry Obomba nationalized the entire student loan industrial complex. The Feds are just another middleman. The money is still issued out of thin air by the banksters. The Fed's Financial Accounts: What Is Uncle Sam's Largest Asset? Note: We've updated the quiz based on yesterday's release of Q4 2017 Financial Accounts of the United States (previously referred to as the Flow of Funds Accounts). Hint: The correct answer is the same as it was for the last quiz. Pop Quiz! Without recourse to your text, your notes or a Google search, what line item is the largest asset in Uncle Sam's financial accounts? The correct answer, as of the latest quarterly data, is ... Student Loans. The rapid growth in student debt has been an ongoing topic in the financial press. 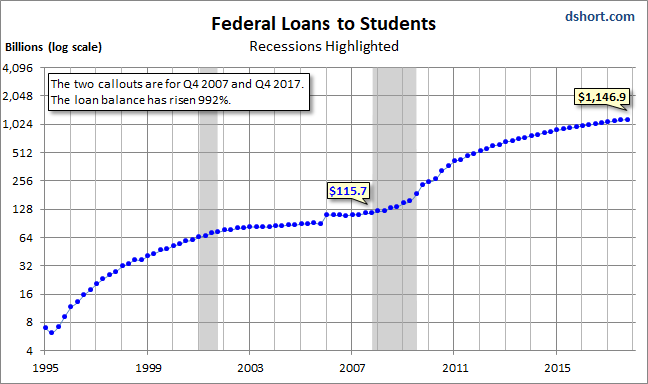 A stunning chart that continues to haunt us illustrates the rapid growth in federal loans to students since the onset of the great recession. 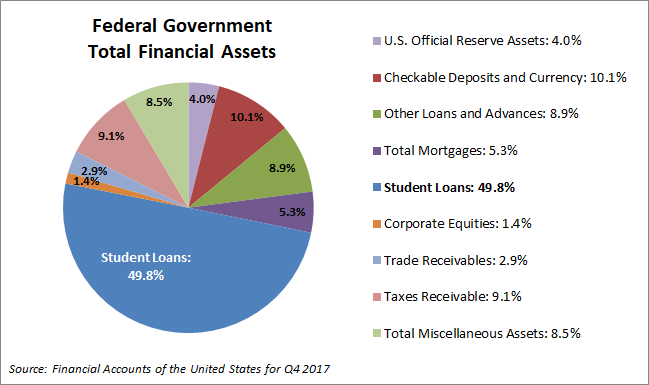 The chart is based on the Federal Reserve's Financial Accounts data (available here) for government's assets and liabilities. We've used a log-scale vertical axis. For a more dramatic look at the same data, here it is with a standard linear axis. As we point out on the chart, the two callouts are for Q4 2007, the quarter in which the Great Recession began (December 2007), and the most recent quarter on record, Q4 2017. The loan balance has risen an astonishing 992 percent over that time frame, most of which dates from after the recession. 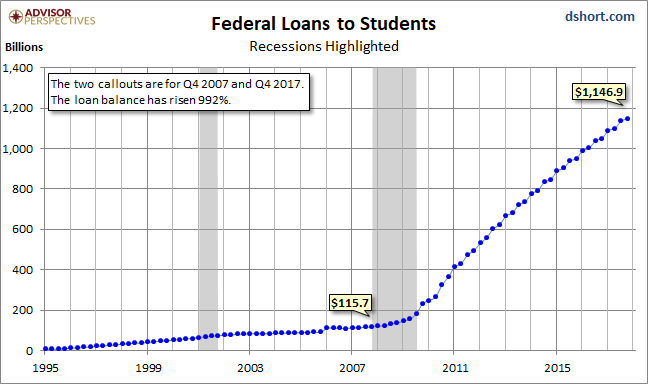 This chart only includes federal loans to students. Private loans increase the debt burden. The Federal Reserve Bank of New York regularly tracks household debt and credit. In their most recent update, they calculate student loan debt to be nearing $1.38 trillion. Incidentally, the number of defaulted student loans hit a new high in 2016, according to a 2016 Time article. But back to our quiz. Student loans may be a liability on the consumer balance sheet, but they constitute an asset for Uncle Sam. Just how big? It's 49.8 percent of the total Federal assets. This is 9.5 times larger than the 5.3 percent for the Total Mortgages outstanding and 5.5 times the size of Taxes Receivable at 9.1 percent. The 49.8 percent referenced is below its peak. Here is a look at how this metric has changed since 1995. Of course, assets are, sadly, the trivial side of Uncle Sam's Financial Accounts balance sheet — about 2.30 Trillion. The liability side totaled 19.19 Trillion at the end of Q4 2017. 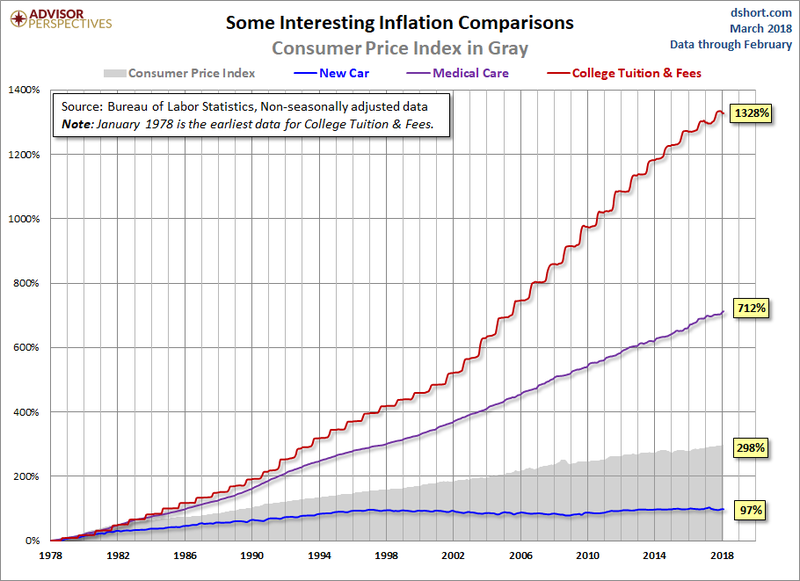 Here is a chart of data from the relevant Consumer Price Index sub-component reaching back to 1978, the earliest year Uncle Sam provides a breakout for College Tuition and Fees. As an interesting sidebar, we've thrown in the increase in the cost of purchasing a new car as well as the more substantial increase for the broader category of medical care, both of which pale in comparison. During the decade of the 1990's, when real out-of-pocket funding declined 25%, tuition and fees rose 92%, which sounds substantial ... until you compare it to the 1328% across the complete data series. For early boomers paying for college was sort of like buying a car. But in recent decades, it has become more like buying a house, for which the strategy of a minimum down payment is commonplace for first-time buyers. 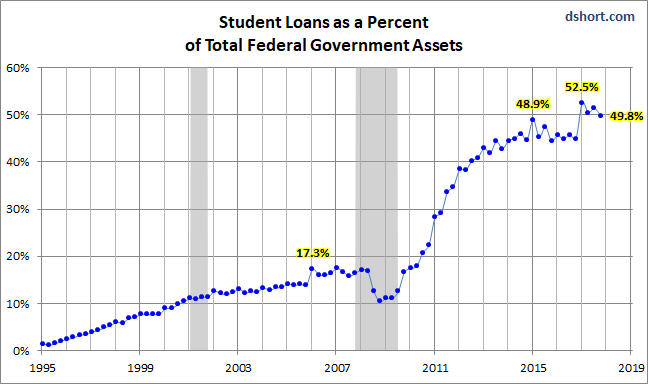 The student loan bubble, the biggest slice in Uncle Sam's asset pie, will haunt us for many years to come. Probably a better use for the money than the value of the education most of them are getting. Gambling with borrowed money earmarked for education. Sounds about right. However, I suspect a great deal of the borrowed money goes for things like spring break, pizza, beer, concerts, dope, clothes, car stereos, on and on. This is in fact correct. Thought is the rules will change..... no payback. Trusting 18 yr olds with guns ? Trusting18 yr olds with student loans ? Wonder what suicide rate is on student loan holders ? The whole thing is a shadow false economy. I can only speak to what I personally have seen. Students driving new cars paid for by student loans. Students with an extensive, expensive, fashionable wardrobe paid for by student loans. New car stereo and alarm system, paid for by student loans. I can't count the vacations funded by student loans. Expensive entertainment funded by student loans. Apartment living [very nice apartments in an expensive area of the city] paid for by student loans rather than more economical arrangements, including offered free-living at home. Furniture [brand new] to furnish those expensive apartments funded by student loans. Diet consisting of carryout delivered and in restaurant food. The most expensive way to eat. Funded by student loans. These are things I have seen personally. Young people are actually very naive and, in my opinion, are generally suckers. They aren't necessarily of bad character, they just follow their feelings and don't look to the future. Now many of these suckers are in their 30's with the vanguard entering their 40's. At this point, they would have to have serious memory loss to not understand how stupid they were and how they squandered their future for easy money. But of course, denial is not just a river in Egypt. Even stupider are the parents who co-signed for some of these loans. I also personally know of people who lost their retirement savings to this, the children did not get degrees, but the co-signer must work past retirement age as the retirement money was squandered. Children who got the money nowhere to be found financially of course. This obviously will not end well. If the government was "smart" ( ) the loan money would go into escrow accounts that could only be used to pay for actual expenses: tuition, room and board, books, etc. You want some extra money for partying, go get a friggin part-time job, like millions of students have done for decades.